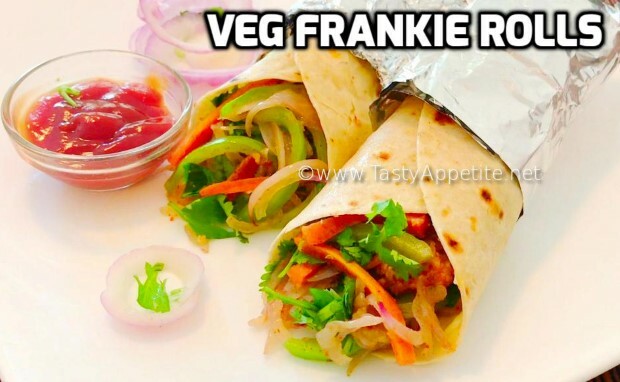 Veg frankie rolls are a delicious lunch box or party pack-up recipe. In this recipe the chapati wraps or rolls are stuffed with a healthy, mildly spiced mixed veg stuffing. Its one of the kids favorite recipe. This popular street food is very easy to prepare at home within 25 mins. I prepare it very often and its absolutely delicious too. Check out the yummy recipe here! Add sliced onions and toss for a minute. Add sliced carrots and capsicum. Add 1/2 tsp of salt, 1/2 tsp of red chilli flakes and a pinch of chat masala pwd. Add boiled and mashed potato. Add finely grated paneer and toss. Add peas and coriander leaves. Add turmeric pwd, red chilli pwd, coriander pwd, cumin pwd, garam masala pwd, chat masala pwd and amchur pwd. Once the masala thickens, turn off flame and allow to cool. Once the veg stuffing is cooled, knead it to thick dough as shown in video. Drizzle oil and shallow fry until done. Melt a tsp of butter in frypan. Place the chapatis and roast it for a minute. Repeat the same for all the chapatis. Lets prepare rolls - Take a chapati, smear with butter. Sprinkle red chilli flakes and chat masala pwd. Add the fried veg pattie and top with more coriander leaves. Now fold the bottom part of chapati. Fold the sides to form a wrap as shown in video. Wrap it with aluminium foil. Healthy delicious veg frankie rolls are ready. It tastes yummy by itself or along with tomato ketchup or any dip of your choice.